(1834 - 1903) - U.S.A.
James Whistler is noted for his paintings of night-time city scenes, his stylish full-length portraits, and for his brilliant etchings and lithographs (a type of print). He was born in the United States but traveled to many countries and settled in England. Whistler developed his own style, using muted colors and simple forms. His philosophy was art for art's sake. Whistler had a significant influence on European and American artists of the late nineteenth century. Whistler saw a connection between painting and music, and he liked to give musical titles to his paintings, using words such as symphony, harmony, nocturnes, and arrangements. Whistler won considerable success in Paris when Symphony in White, No. 1: The White Girl (1862) was shown. Whistler’s most famous painting and our painting of the week is​ ​Arrangement in Grey and Black No. 1, which is usually, and incorrectly, referred to as Whistler’s Mother. This full-length portrait is nearly all monochromatic. Monochromatic means shades and tints of just one color. The monochromatic color scheme in this painting is based on black. Gray is a tint of black. You get a tint of a color by adding white to it. Shades of a color are made by adding black to the color. According to a letter from his mother, after a model failed to appear, Whistler turned to his mother and suggested he do her portrait. In his typically slow and experimental way, at first he had her stand, but that proved too tiring so the famous seated pose was adopted. It took dozens of sittings to complete. From the beginning, some have liked the painting and some have not. Some considered it to be a perfect symbol of motherhood while others just made fun of it. During the Depression, the picture was billed as a "million dollar" painting and was a big hit at the Chicago World's Fair. 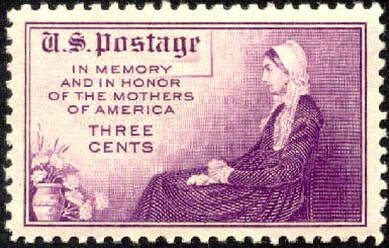 In public recognition of its importance and popularity, the United States featured it on a postage stamp in 1934. 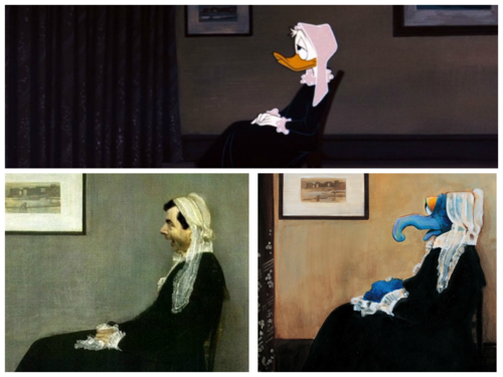 Whistler’s Mother has been imitated in endless ways for greeting cards, magazines, cartoons and others. The French government purchased Whistler’s Mother, and it is now housed in the Orsay Museum in Paris. An author said that only a few artworks have become important both to museum visitors and within popular culture. 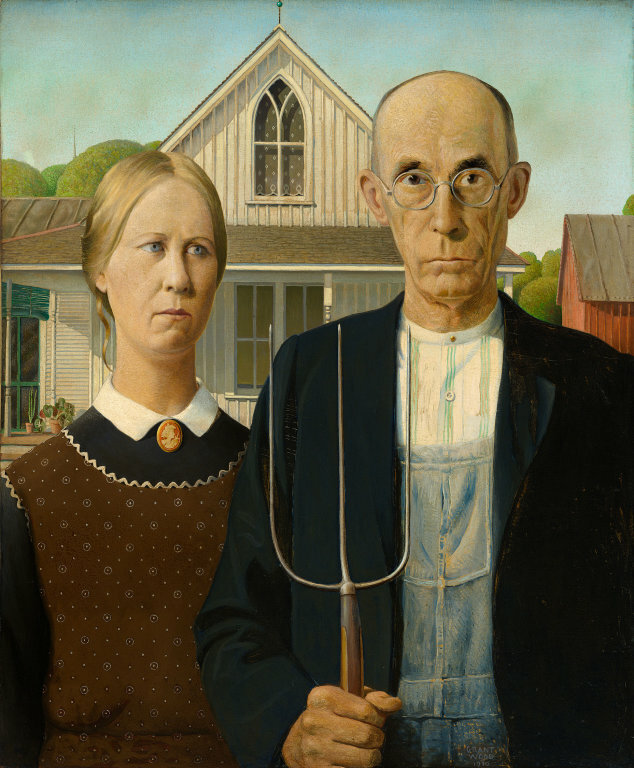 The four artworks that have become part of popular culture are: American Gothic, Mona Lisa, The Scream, and Whistler’s Mother. These were all previous paintings of the week. histler’s famous signature for his paintings was in the shape of a stylized butterfly possessing a long stinger for a tail. Whistler's butterfly signature first developed in the 1860s out of his interest in Asian art. He studied the potter's marks on the china he had begun to collect and decided to design a monogram of his initials. Over time this changed into the shape of an abstract butterfly. By around 1880, he added a stinger to the butterfly image to create a mark representing both his gentle, sensitive nature and his more feisty spirit. It took time for Whistler to find his place as a serious painter. He did take private art lessons as a boy, but he was later sent to a religious school with his mother’s hopes that he would become a minister. When it became clear that being a minister would not suit him, Whistler was accepted into the West Point Military Academy. His grades were barely satisfactory, and he was a sorry sight at drill and dress. When he racked up demerits, the West Point Superintendent, who was future Confederate general Robert E. Lee, had to dismiss him from the school. Next, Whistler worked as a draftsman mapping the entire U.S. coast for military and maritime purposes. He found the work boring and he was frequently late or absent. After it was discovered that Whistler was drawing sea serpents, mermaids, and whales on the margins of the maps, he was transferred to the etching division of the U. S. Coast Survey. He lasted there only two months, but he learned the etching technique which later proved valuable to his art career. At this point, Whistler firmly decided that art would be his future. Establishing himself as a painter in Paris and London, Whistler developed his distinctive style, utilizing muted colors and simple forms. Whistler was a leader in the idea of “art for art’s sake”. Whistler was one of the most significant figures in American art. He is celebrated for his innovative painting style. Whistler was concerned with the way his paintings were displayed. 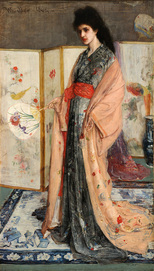 A wealthy English businessman, Mr. Leyland, owned one of Whistler’s paintings, The Princess from the Land of Porcelain. Leyland placed it in the dining room of his London house, where he displayed his impressive collection of Chinese porcelain. 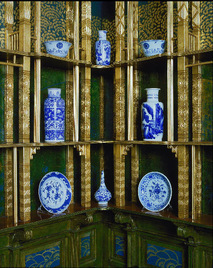 To better display the mostly blue and white porcelain, Leyland hired an architect to design a display space. 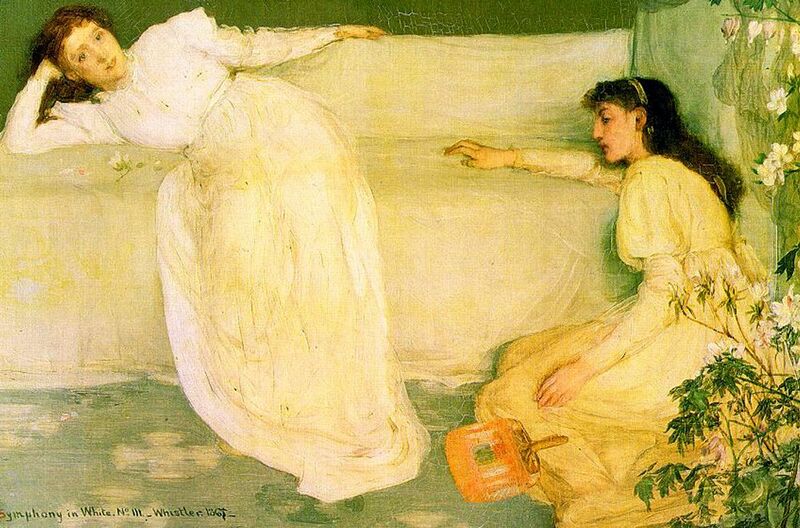 Since Whistler’s painting hung over the fireplace, the architect asked Whistler his opinion about the room’s color. Leyland was away on business and Whistler got absorbed in redesigning the dining room. His imagination took flight, and he covered the room, from the ceiling to the walls, with peacock patterns, painting large blue and gold peacocks on the shutters. He made the entire room a work of art. Whistler wrote to Leyland that he had a gorgeous surprise awaiting him. Leyland returned and was surprised all right, because Whistler had done far more to the room than he had wanted, and the cost was much more expensive. The men quarreled. 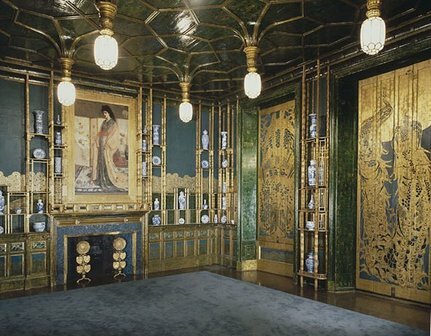 After Leyland agreed to pay only half, Whistler did some more work on the room. He painted two more peacocks on the wall opposite The Princess from the Land of Porcelain painting. The birds faced each other, as if about to fight. Whistler titled the mural Art and Money; or, the Story of the Room. In later years, Charles Freer, an American railroad man, bought the painting and the entire room and installed it in his Detroit home. He donated it to the Smithsonian Museum before his death. The Peacock Room can be viewed today when visiting the Smithsonian Museums in Washington D.C.
VA.5.5.2 Compare and contrast the physical relationships of shapes and forms.